A significant hurdle to developing effecive cancer immunotherapy drugs is the fact that they can be highly effective against advanced cancers in some patients, while having little to no effect in other patients. To try to understand the genetic basis of these differing responses, scientists at the U.S. National Institutes of Health developed a genome-scale CRISPR/Cas9 screen that allowed them to knock out every single gene in a melanoma cell line and then systematically test each gene for its effect on T-cell responses against the melanoma. Using this “two-cell type” (2CT)-CRISPR assay, the researchers, led by Shashank Patel, Ph.D., and Nicholas Restifo, M.D., who is a senior investigator with NCI’s Center for Cancer Research, identified more than 100 “essential” genes that were required in the melanoma line for T cells to effectively engage with and kill the cells. When these genes were knocked out, the tumor cells were more able to resist exposure to T cells that had been engineered specifically to recognize tumor-associated antigens. The researchers published their studies in the August 7 issue of Nature, in a paper entitled “Identification of Essential Genes for Cancer Immunotherapy.” The NIH team worked in close collaboration with Feng Zhang, Ph.D., from MIT, one of the original innovators of the CRISPR technology. Neville Sanjana, Ph.D., from the New York Genome Center and New York University was co-first author of the study. CRISPR/Cas9 screens have previously been used to identify genes that play key roles in cancer cell proliferation, drug resistance, and metastasis, the authors point out. 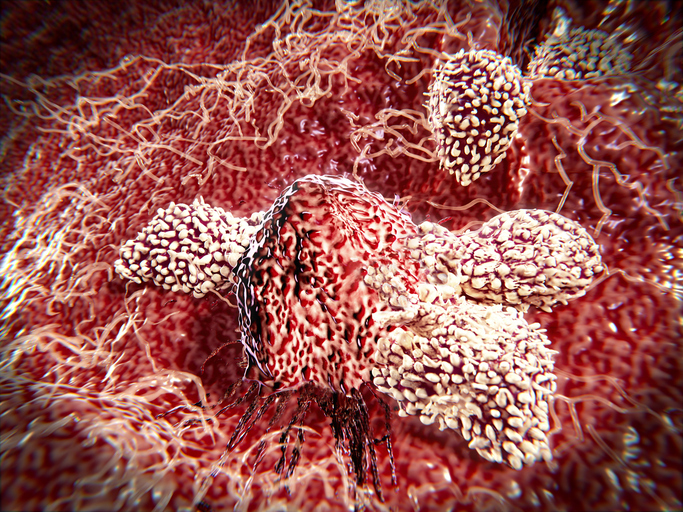 To identify which genes in tumors are requisite for the “effector function of T cells,” the team developed the 2CT-CRISPR assay, consisting of human T cells as effectors and melanoma cells as targets, to evaluate the effects of individual gene knockouts on cancer cell susceptibility to T-cell killing. Many of the hundred or so genes identified were directly involved in cytokine release, or in antigen processing and presentation, but dozens of the genes identified were not known to be required for cytotoxic T-cell-based immunotherapy. With their list of the 100 most necessary tumor genes in hand, the researchers looked at the gene expression profiles of nearly 11,500 human tumors from The Cancer Genome Atlas (TCGA) database, across 36 tumor types, to see whether loss of these tumor genes associated with decreased cytolytic activity. The analysis identified a set of 19 genes that correlated with cytolytic activity across most of the cancer types. Ten of these were inducible by interferon-γ (IFNγ), which indicated that they might be upregulated in cancers because of increased T-cell mobilization. “Loss of expression of these 19 genes within tumors could diminish or extinguish the presentation of tumor antigens (including HLA-A, HLA-F, B2M, TAP1 and TAP2); T-cell co-stimulation (ICAM1, CLECL1, LILRA1 and LILRA3); or cytokine production and signaling (JAK2 and STAT1) in the tumor microenvironment that drive infiltration and activation of T cells, and thus serve as a principal mechanism in immune evasion,” the researchers write in their published paper. The team next focused on one gene, APLNR, which codes for the apelin receptor, a G protein-coupled receptor (GPCR) that hadn’t previously been associated with T-cell killing of cancer, but which is known to be mutated in a number of different tumor types. They identified seven different mutations in this gene in the genetic makeup of metastatic melanoma and lung cancer patients who had failed therapy using immune checkpoint inhibitors.